A 16:9 WQVGA full color display floats in or near your line of sight, providing an image visually equivalent to a 4 in. smartphone screen held at a typical 14 in. distance. Display arm adjustments, display tilt, and left or right eye mounting options enable you to position the M100 for maximum effectiveness and viewing comfort. A convenient display shield maximizes visibility in bright outdoor sunlight and the small display size minimizes the visual obstruction of the environment around you. Vuzix M100 Smart Glasses incorporate a compact White Pearl™ display module and ultra-low power driver IC, both provided by the Kopin Corporation. Which is your dominant eye? A variety of frame mounting options are available, including safety glasses and sleek frames; both allow for left or right eye use. The image in the M100 display rotates automatically to accommodate either mounting option. How do you control apps and features with a wearable hands-free device? With Vuzix M100 Smart Glasses, we provide a variety of methods of control. Three control buttons on the M100 provide basic interface navigation capability, and the optional iOS and Android partner application allows for touch-based input and convenient access to settings. In addition, we support a suite of native and custom voice commands for navigation and application control, as well as gesture controls. This section is somewhat outdated; I would advise that we remove it. We already cover the paired smartphone application in the control section. The integrated camera on Vuzix M100 Smart Glasses is capable of capturing 5 megapixel still images and 1080p high-definition video. Video and image captures can be stored directly on the M100’s memory (expandable up to 32GB) or streamed live over the internet. Where privacy may be a concern, a video recording indicator light on the face of the M100 will inform those around you that video is being recorded, in accordance with accepted standards for video cameras around the world. Vuzix M100 Smart Glasses contain a single on-ear speaker, and dual microphones with noise cancellation for voice controls and recording. Included with every pair are ear cups which help channel the sound from the speaker into your ear, enhancing comfort and your ability to hear the audio in louder environments. Battery life, or “runtime”, is an important consideration, especially in mission critical applications. Depending on usage, battery life of Vuzix M100 Smart Glasses can range from 1-3 hours. Included with every M100 is an external battery pack, which can extend runtime up to 5-6 hours when connected to the USB micro-B power connector. We should remove this section, it is very clear to anyone looking to purchase an M100 that we offer both colors when they go to the webstore. 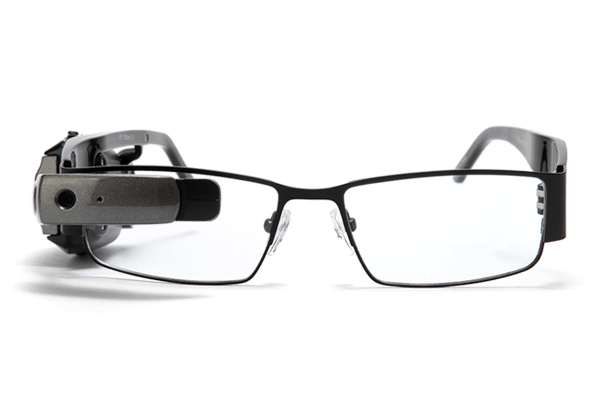 Smart Glasses are a wearable display system with onboard intelligence. They can range from wearable display systems with only rudimentary data display capabilities to products that rely upon remote cloud connectivity for application and data processing, up to devices such as the M100 that incorporate a complete Android system comparable to current smartphones. The Android system embedded in the M100 is able to run many thousands of existing Android apps plus Android apps customized or created exclusively for its unique design.